Here in the Pacific Northwest, it’s prime berry pickin’ season! It’s been so hot the blackberries are ripe earlier than usual, the raspberries are teaming off the vines, and U-Pick blueberry farms are busy busy busy. What better use of berries than to mix them all up in a mouth-watering medley? I love this crisp because it tastes light and refreshing, and is the perfect summer dessert. I love that you can throw the ingredients together so quickly and pop it in the oven. Feel free to modify the amount of sugar to your heart’s desire. I find that the berries add such a natural sweetener that not too much sugar is needed. I like to whip up real cream and put a healthy dollop on top. Enjoy! 4 tablespoons white, organic sugar. In bowl, toss together berries and white sugar. In another bowl, combine flour, oats, brown sugar, cinnamon, and nutmeg. Mix in butter until crumbly. 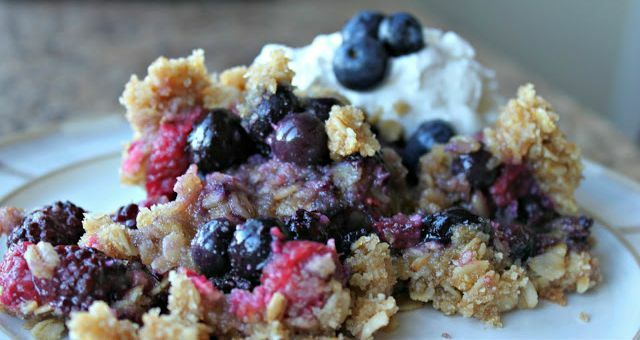 Press half the mix into the bottom of a pan, cover with berries, and sprinkle remaining crumble mix over the top. Bake in preheated oven for 30 to 40 minutes, or until bubbly and golden brown. This sounds amazing. I think I’m going to have to whip some up this afternoon. Thanks for sharing! Let me know how you like it! It’s such a quick and easy thing to throw together. Perfect timing! We just discovered that our blackberries are ripe! They are everywhere over here! I made a bunch of jam last night too! Can’t wait to try this! You’re right too, oats are naturally gluten free, but regular oats can have gluten from cross-contamination.